New procedures are explored for the development of models in the context of large eddy simulation (LES) of a passive scalar. They rely on the combination of the optimal estimator theory with machine-learning algorithms. The concept of optimal estimator allows to identify the most accurate set of parameters to be used when deriving a model. The model itself can then be defined by training an artificial neural network (ANN) on a database derived from the filtering of direct numerical simulation (DNS) results. This procedure leads to a subgrid scale model displaying good structural performance, which allows to perform LESs very close to the filtered DNS results. However, this first procedure does not control the functional performance so that the model can fail when the flow configuration differs from the training database. Another procedure is then proposed, where the model functional form is imposed and the ANN used only to define the model coefficients. The training step is a bi-objective optimisation in order to control both structural and functional performances. The model derived from this second procedure proves to be more robust. 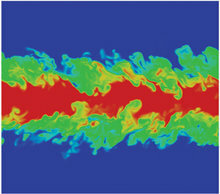 It also provides stable LESs for a turbulent plane jet flow configuration very far from the training database but over-estimates the mixing process in that case.